Broken down in Bandon, Ballymount or Buncrana mis-fuelled in Mallow, Milltown or Mooreenaruggan, cut out in Clondalkin, Clifden or Carlow? Irish Towing will get you going. Irish Towing Services, a leader in the field of vehicle recovery in Ireland, was established by Alan Sherwood in 1986 and since then the company has come to the assistance of hundreds of thousands of motorists. 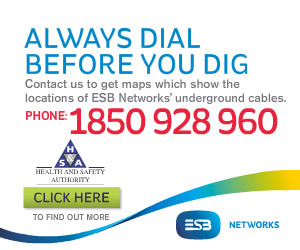 Renowned for a professional and reliable service, these are exciting times for the Dublin based business as they recently rolled out their new nationwide service. With a network of recovery operators throughout the country, they will have you back on the road or onto a recovery vehicle as quickly as possible. 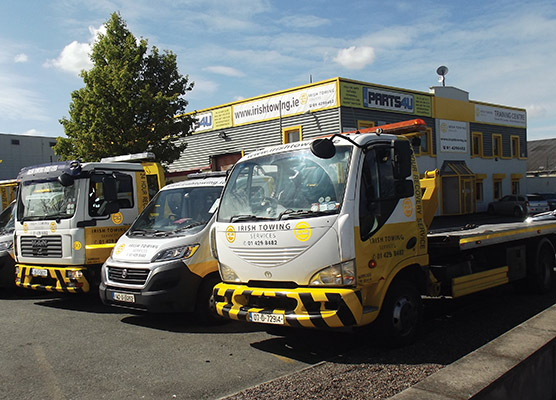 The company's fleets of modern vehicles and premises at Turnpike Road, Ballymount, Co Dublin have also undergone a facelift to coincide with the expansion of their business and yellow and white are the colours of choice when it comes to their new-look branding. “We wanted to freshen things up and get our name out there,” explained Cora Sherwood to Irish Trucker. Irish Towing Services' boasts a long list of satisfied customers who can vouch for the professional 24/7 services they provide.Their well-established reputation has been built on the knowledge, experience and expertise gained over the past 29 years. This reputation has helped to secure contracts with motoring assistance organisations, insurance companies and An Garda Siochana as well as car franchise dealers, fleet management companies, car rental companies and financial institutions. “We now operate a network within our own industry, providing a nationwide service and that gives us a big edge,” Cora added. “It's early days but we are very happy with our progress so far. We're trying to work for the industry, give everyone within the industry a good chance at it, a fair crack of the whip and recognition. A member of the Institute of Vehicle Recovery, Society of Irish Motor Industry, Association of Vehicle Recovery Operators and International Federation of Recovery Specialists, ITS specialise in roadside assistance, secure vehicle storage, vehicle disposal, towing, servicing and repairs and serviceable car parts. Very much a family affair, Alan and Cora are joined in the company by their two eldest sons Rob and Sam and daughter-in-law Nicola who will help them ensure the continued success of the business for future generations. As manager of the workshop, Sam oversees the full range of mechanical repairs and diagnostics they offer including routine service, interim service, winter check, pre NCT check, clutch, engines and gearbox. Rob, meanwhile, is a qualified CPC trainer and runs Irish Towing Services' full-time training centre and they have ambitious expansion plans for this area of the business. Compliance also remains a cornerstone of their business philosophy. All their vehicles are regularly inspected and certified in compliance with all legislation and also in compliance with PAS43 which is a recognised “Best Practice” within the recovery industry. Irish Towing Services has also received ISO-9001 2008 accreditation for providing a quality service and they are a Licenced Transport Operator, which allows them to transport all vehicles not only those that have broken down or been involved in an accident. “In this business you have to keep everything right and compliance is something that we haven't allowed to drop down the years. We may have lost some contracts on price as result but we haven't lost compliance. Irish Towing Services' years of experience, ISO 9001:2008 accreditation, emphasis on Health & Safety and Recovery Training will help you know you are making the right choice when you use their services. If you would like them to quote for your business needs, contact them and they will be happy to tailor a plan to suit. Turnpike Road, Ballymount, Dublin 22.